Isagenix Cleanse Days - What Are the Benefits? Isagenix cleanse days are renowned for their ability to detoxify the body and rid it of built up toxins and impurities. Unlike other types of cleansing programs, which often involve the use of laxatives and flush out vital nutrients right along with the toxins, Isagenix cleanses are designed to nourish your body; resulting in a healthier and happier you. Isagenix believes wholeheartedly in the power of nutritional cleansing. Rather than leaving your body feeling depleted and weak, nutritional cleansing provides it with the vital nutrients, vitamins, minerals, and botanicals it needs to not only flush out toxins, but to also perform at its absolute best. During an Isagenix cleanse day, the molecules in your body target proteins and transform them into amino acid building blocks. This is known as protein degradation and goes hand in hand with autophagy, which is a process that removes damaged molecules from cells. Top scientists at the University of Illinois at Chicago and a number of other institutions have examined the effectiveness of cleanse days and shake days in causing weight loss. From the results of numerous studies, the scientists learned that cleansing boosts weight loss and reduces inflammation. Cleansing with Isagenix, however, provides even more benefits. By using Isagenix’s dietary approach to cleansing, you’re able to raise your body’s ketone levels. Since ketones are responsible for breaking down fat, Isagenix cleanse days are proven to lead to weight loss. Third-party clinical study performed at the University of Illinois at Chicago (UIC) demonstrated that cleanse days out performed a traditional heart healthy diet. The 10 week study evaluated the effects of both dietary plans on body weight, body composition, cardiovascular risk factors and oxidative stress markers in 54 obese women with a body mass index above 35. The two groups fasted one day per week. However, the Isagenix subjects consumed the herbal-drink Cleanse for Life, whereas the subjects on the heart-healthy diet received a similar product to serve as placebo. The results? For the full study and results, download the PDF here. The body is designed with a mechanism known as autophagy to remove damaged molecules from cells. When you regularly eat three meals a day, the cells remain in growth mode, preventing damaged molecules from being removed. An Isagenix cleanse day gives your body the time it needs to target damaged protein molecules for removal, thus improving your digestive function. 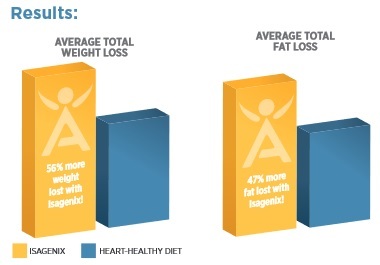 Isagenix cleanse days improve cardiovascular health and reduce LDL cholesterol levels. As a result of weight loss, lower blood pressure is also widely reported. For the full schedule, hints and tips, download the Isagenix weight loss guide here. Use your Isagenix cleanse day planner. In order to get the most out of your cleanse and stay on schedule, you should try to follow the Isagenix cleanse day planner as closely as possible. Keep your refrigerator stocked with healthy foods. If need be, throw or give away any soft drinks, funk food, and so on to help you avoid the risk of temptation. Make a list of meals and snacks you plan on eating each week for both cleanse days and shake days. Try to stick to the list and never go to the grocery store hungry! Keep track of your weight loss and measurements. In addition to weighing yourself regularly, you should take measurements of your waist and thighs each week. Write your weight and measurements down each time you take them in a journal to keep track of our progress and provide a little extra motivation when needed. Keep busy and drink plenty of water. Isagenix recommends drinking three to five litres of water during each cleanse day in order to keep your body from becoming deteriorated and allow it to fully enjoy the benefits of nutritional cleansing. You should also keep yourself busy to avoid thinking about food. For more tips, see our in-depth guide here. Nutritional cleansing is the cornerstone of each and every Isagenix program. However, Isagenix cleanse days should not be undertaken for extended periods of time. Therefore, you shouldn’t cleanse for more than two consecutive days in any given week. 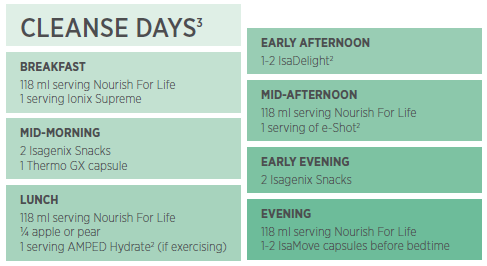 Since Isagenix cleanse days involve intermittent fasting, you should nourish your body as recommended on each cleanse day and enjoy shake days in between. By following these tips and exercising regularly, you will achieve your weight loss and health goals safely in no time at all!